This Feb. 18, 2019 photo provided by Ben Lepe shows Maleah Ballejos reunited with her dog Kingston in Paradise, Calif. The Akita named Kingston was reunited with his family 101 days after he jumped out of their truck as they fled a devastating Northern California wildfire. A dog named Kingston is back with his family 101 days after he jumped out of their truck as they fled a devastating Northern California wildfire. 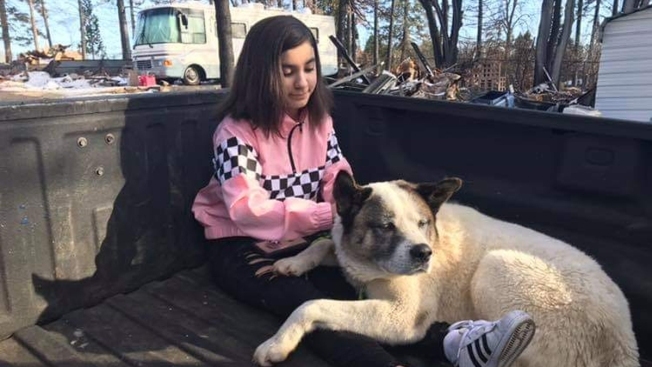 The 12-year-old Akita was reunited Monday with the Ballejos family, who fled the town of Paradise late last year, Sacramento television station KXTV reported. "When I found out, (it) just about brought me to tears," said Gabriel Ballejos, Kingston's owner. "I'm so proud of him. I can't believe it. He's a true survivor, and it's a testament to the American spirit." It's been 100 days since a wildfire nearly burned the town of Paradise off the map. The Nov. 8 blaze destroyed nearly 15,000 homes in the Northern California city of 27,000 residents. The long recovery is just starting. "Every night I would ask my dad and tell him that we needed to go look for him," said Ballejos' daughter, Maleah. "When I went to check it on Sunday, there he was," Lepe said. "It was awesome to see him and know he would be fed and warm." "If we had the resources, we could trap 50 animals every single night," she said.